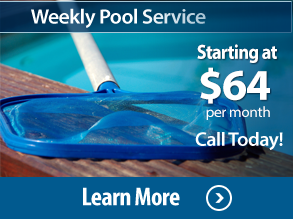 A sure way of keeping your pool in pristine condition is to schedule a weekly service plan. At California Pool Care this includes removing debris on the bottom of the pool, complete a chemical balance analysis which may require adding chlorine or other sanitizer to satisfy the pool requirements, test and adjust the chemical sanitizer levels, check the water level to be sure the pump is able to operate properly, skim the surface for floating debris, vacuum, test and adjust the pH, empty the skimmer and pump basket, empty the pool cleaner bag/basket, if necessary check the filter pressure and backwash, and brush the tiles. Not all of these services may be required at any one time. 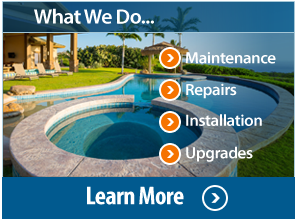 At California Pool Care we offer several services to take the hassle out of keeping your pool properly maintained. 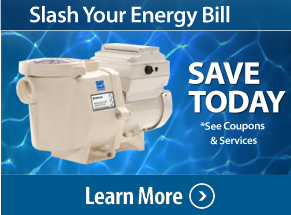 We offer 4 different types of service levels to fit your budget and the demands of your pool. Call a California Pool Care technician for additional information. Having proper chemical balance is the backbone to swimming pool maintenance. A weekly chemical service can give you peace of mind knowing that your family is swimming in a safe aquatic environment. 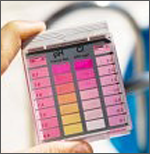 Let us take care of the weekly testing and chemical adjustments of your pool/spa. Empty debris from skimmer and pump baskets. Make seasonal adjustments or recommendations for the time clock settings. 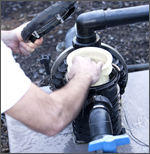 Visually inspect pool equipment for proper operation. Skim pool and connected spas surface, netting leaves and debris. 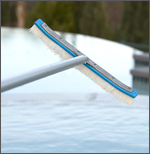 Making sure your pool//spa is spotless from top to bottom. Skim pools surface, netting leaves and debris. Brush pools steps, seats and walls as needed. Vacuum for small debris as needed. 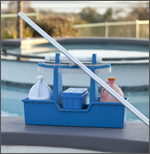 Weekly service chemicals include chlorine, muriatic acid, sodium bicarbonate, chlorine tabs, and calcium. Not included is salt, phosphate remover, stain and scale preventative, conditioner, algaecides and specialty treatments.